What do Christmas trees, turkeys and cover crops all have in common? 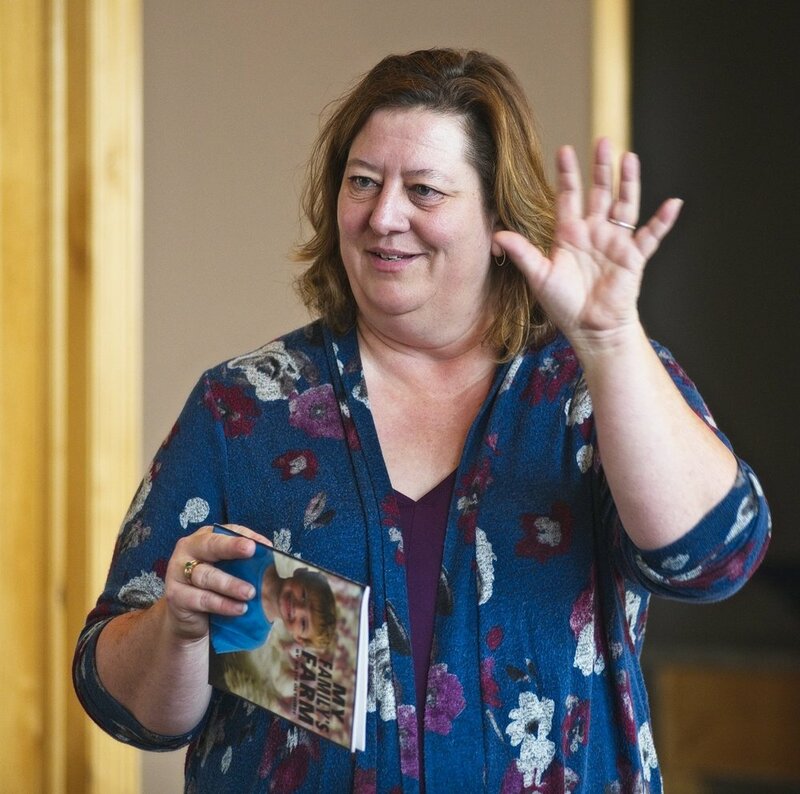 Beyond their natural ties to Iowa’s agriculture economy, they were the topic of the Iowa Food & Family Project’s (Iowa FFP) third Food U event. With Food U participants bundled up and filled with questions, the first stop of the tour was Walnut Ridge Farm in Indianola. One of the largest tree farms in Iowa, Walnut Ridge is owned and operated by Jane and Gary Harman, along with son Todd, and his wife, Jen. They have been selling Christmas trees and greenery since 1983. Even though they have expanded their planted area over the years, which now covers 40 acres, their goal remains the same. 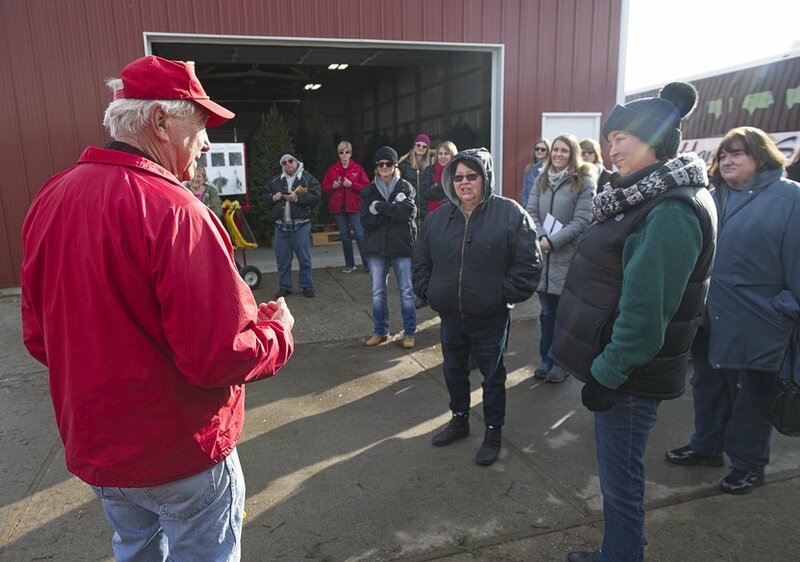 Gary Harman visits about his tree farm during a recent Food U tour. 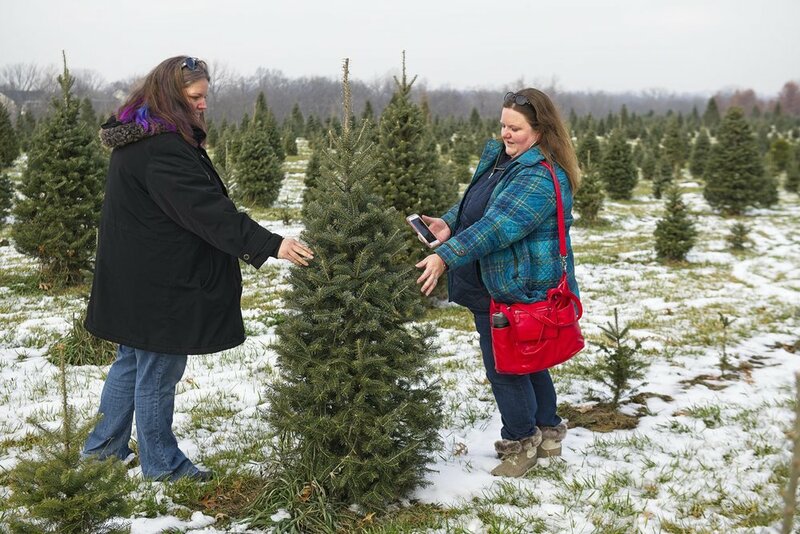 “We want each customer to experience the joy of selecting a real Christmas tree while creating a memory to cherish for many years,” Gary Harman says. Visitors can spend as much time as they like selecting from the more than 40,000 trees at the farm. After finding the “perfect” tree, the buyer is allowed to cut the tree down for the full tree-harvesting experience. The Harmans start planting trees as soon as the frost is out of the ground, typically in late March or early April. Each spring, they plant 4,000-11,000 trees, which start as seedlings that are 12-18 inches in height. At that size, the trees are already 2-4 years old and mature to appealing Christmas-tree height when they are approximately 10 years old. Planting the trees is just one step in the process of creating the perfect focal point of holiday décor. Every summer, the family spends 400 hours shearing trees – meaning the Harmans are shaping of the foliage of the tree to create a pleasing shape and greater density. It’s done with a long shearing knife, made specifically for this purpose. Shearing is different than pruning, which refers to the removal of the lowest branches on the tree to create a branch-free handle. "I was surprised by the amount of work that goes into a tree farm," says Julie Kohles, an Iowa FFP Champion from Johnston. "It's amazing how many hours and how much hand labor goes into it." In Iowa, there are approximately 100 choose-and-harvest Christmas tree farms, and 1 million acres are in production for growing Christmas trees throughout the U.S. Real Christmas trees are grown in all 50 states. “People are always surprised when I say, Christmas trees can claim the title as the longest duration green row crop in Iowa,” Gary Harman says. Not only are the trees beautiful across the landscape or strewn with holiday lights while gracing family living rooms or the lobby of a business, they are also good for the environment. Cumulatively, Christmas Tree Farms produce enough oxygen to keep 9 million people alive every day! Fraser fir and Canaan fir trees make up 85 percent of the trees at Walnut Ridge – both of which are a natural mutation of Balsam fir trees. They are native trees of North America and specifically the Appalachian Mountains. Other customer favorites of White Pine and Scotch Pine are also grown by the Harmans. Altitude plays a factor in the type of trees that grow best in Iowa, as well as moisture and heat. Excessively dry weather can lead to the loss of trees, and if the soil temperature gets above 85 degrees F, the roots can die. For example, Noble fir trees are often known as the ‘Cadillac of Christmas trees’ due to their fragrance and rich appearance. That type of tree thrives in a high-altitude, moisture-rich breeding ground, mostly grown in the Cascade Range and Coast Range mountains of Northern California, Western Oregon and Washington State. Frasier fir trees are also hugely popular. Their mild fragrance, shape, strong limbs and ability to retain its soft needles for a long time after being cut down makes it one of the best trees for decorating. In fact, Fraser fir has been used more times as the official White House Christmas tree than any other tree! Disease is not much of a problem at Walnut Ridge Tree Farm. They have never had to spray their trees for diseases. The growing season and sales period are not for the faint of heart. Ninety percent of Walnut Ridge Farm’s sales happen in the 10 days immediately following Thanksgiving! Wind, rain, snow, sleet or shine – weather is all part of finding that one special tree that speaks to your heart at Christmas. At her home in Runnells, Cristen Clark hosted a robust lunch of Thai Pizza appetizers (featuring turkey), turkey and pork sausage lasagna, fresh bread, salad and homemade desserts. Participants also sampled AE Dairy milk products ranging from festive eggnog to an after-dinner dark chocolate mint milk. During lunch, the group enjoyed a conversation with Gretta Irwin, a home economist and executive director of the Iowa Turkey Federation in Ames. Iowa is home to more than 130 turkey farmers who raise approximately 12 million turkeys each year. The state’s turkey industry contributes about $10 billion to Iowa’s economy. Most turkeys raised in Iowa are processed into deli meat for Jimmy John’s and Subway. Irwin discussed the emphasis turkey farmers place on sustainability and being environmentally responsible in all aspects of their operations. For example, Tim Graber is a fourth-generation turkey farmer from Wayland. His family takes great pride in the way they care for turkeys and how they can help provide safe and reliable food for families in the community, state and nation. While turkey is often associated with the holidays, Irwin shared the many ways to enjoy turkey’s nutritional benefits, great flavor and versatility year-round. “Ground turkey and deli turkey are the most popular turkey items sold in grocery stores,” Irwin says. From using ground turkey in tacos, lasagna or soup to adding turkey bacon or turkey sausage to the breakfast table, the possibilities for turkey are endless. View some recipes here. Turkey packs a nutritional punch. Just a 3-ounce serving of boneless, skinless turkey breast is low-fat and provides a whopping 26 grams of protein. 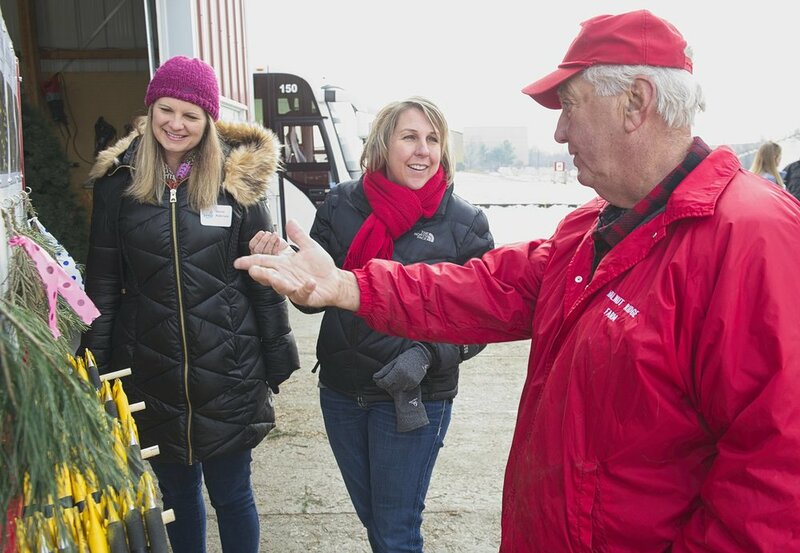 “Every Food U tour I go on opens my eyes about modern agriculture … and how much goes into producing food efficiently and safely,” says Christy VanBuskirk, an Iowa FFP Champion from Hedrick. When you drive by a field after fall harvest or before spring planting season, you may be surprised to see there is still so much plant life. What some confuse as weeds – or unharvested crops – may be intentionally planted cover crops. The group learned about the power of cover crops when it comes to soil health and conservation through the winter months from Brett McArtor, a regional agronomist for the Iowa Soybean Association, and Dan De Vries, a soybean, corn and cattle producer from Prairie City. Farmers use cover crops — such as cereal rye, winter wheat, peas, radishes and clover — to keep a cover on farmland between harvest and planting seasons. Grown in between rows of soybeans and corn, farmers use cover crops for many reasons. The benefits range from retaining nutrients in the soil to holding soil in place to providing forage for grazing animals. When farmers plant cover crops, there are several factors to take into consideration. How much is the cost? What machinery is needed to apply the cover crops? How fast will it grow? How will the crops be terminated when it’s time to plant? For De Vries, it takes one bushel of cereal rye to cover one acre. The cost of the cereal rye is $10-$12 per bushel. Multiply that by hundreds or even thousands of acres, and the cost adds up for farmers. Some livestock and grain farmers receive a dual benefit. The cover crops help their soil and provide grazing opportunities, which can cut down the feed bill for a few weeks or a couple of months. “It was interesting to see that even though the fields look dead in the winter, they are still alive and thriving,” says Andrea Love, an Iowa FFP Champion from Pleasant Hill. Apply to be an Iowa FFP Champion! Are you interested in attending a future Food U event or furthering your understanding of agriculture? Apply to be a member of the Iowa FFP Champions Program. You'll be invited to Food U events, get priority access to speaking engagements, participate in surveys and focus groups, and receive a quarterly newsletter.